Google it. 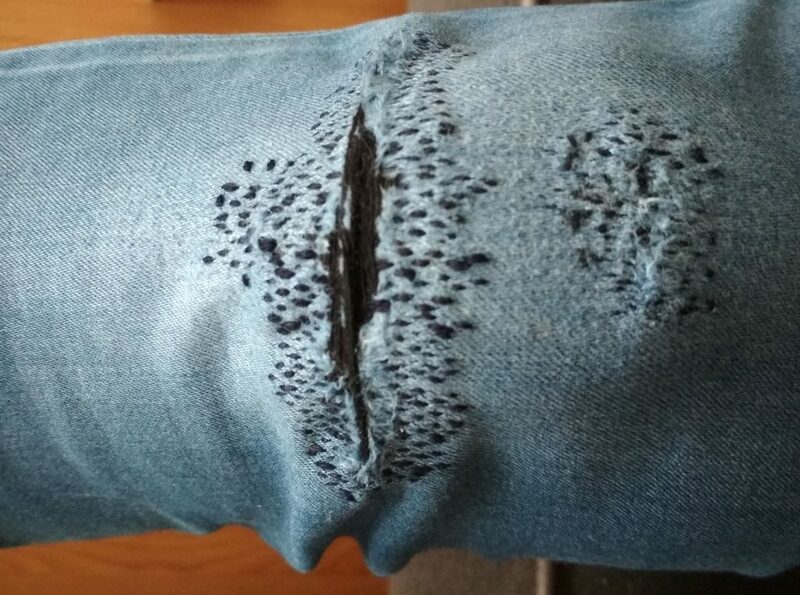 Visible Mending. It is fun! I am used to patching things up either visible or less visible with a machine. 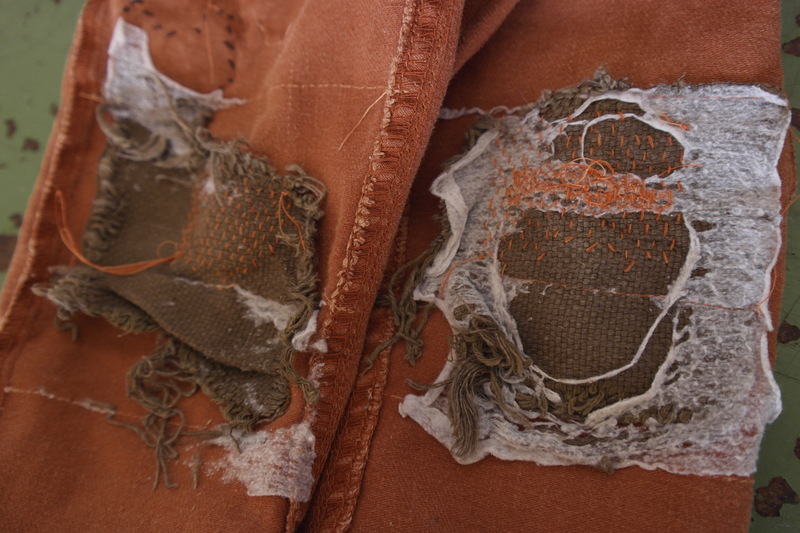 But visible mending is meant to be seen, it is also meant to make old fabric more durable. So you could mend before something even breaks. 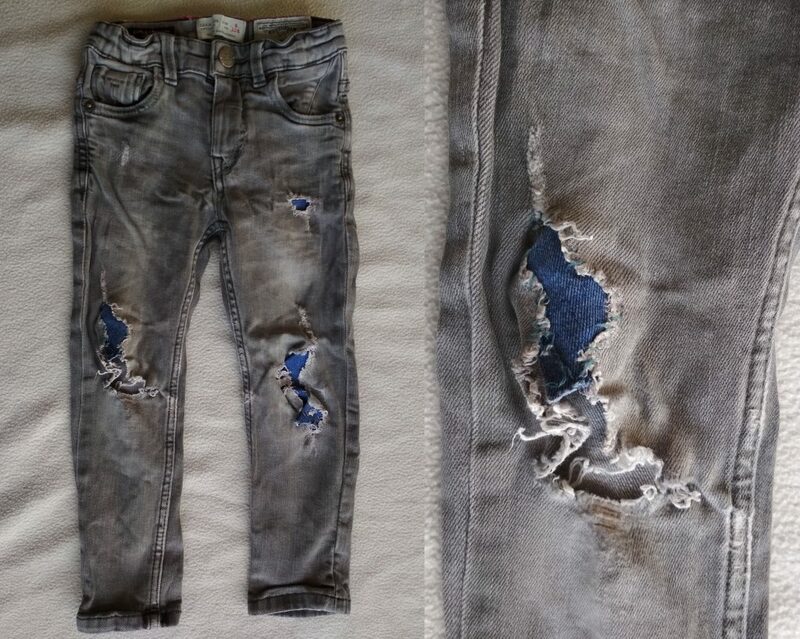 Than here are pants you might recognize from a previous mending attempt. 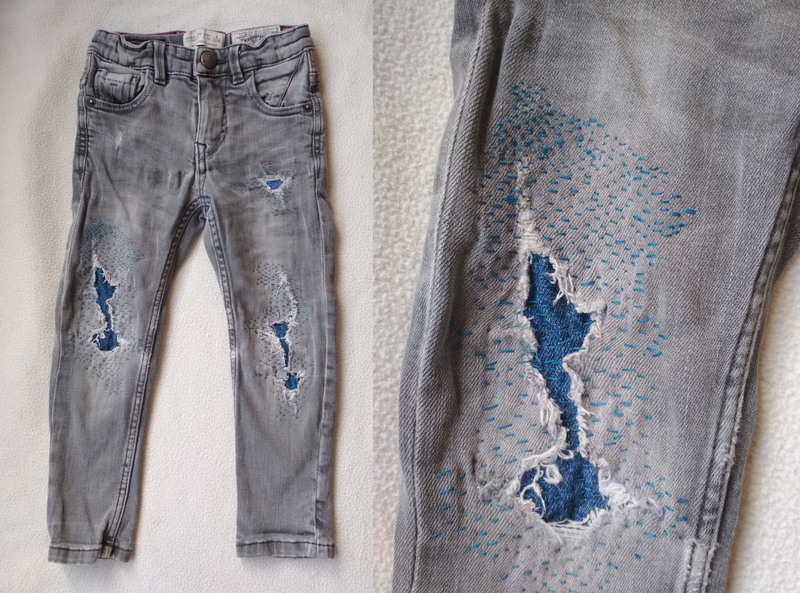 Last time I used the sewing-machine, this time it was my hand-work. Because these pants already have a bright color, and I have used this color thread before, I stuck with the same orange color that blends in with the fabric. Now, because the patches that I previous used on the back have a very nice rough weave, I used this to guide my hand during stitching. I expect it to break again, which I like because it makes the process for mending unpredictable and the outcome nice and playful. In order to make this happen I didn’t sew too far away from the broken fabric. Of course this way making sure the idea of visile mending making your fabric more durable doesn’t work with these pants. I think the back of this fabric is like a painting! From these pictures you can see well that the stitches are only from top to button, not woven through the fabric. through wear and tear, and fixing, it will change. Below one where I started experimenting with the thread that I used. It is partly thicker. Please note I did not use a patch on the back and therefore it remains more stretchy which is nicer to wear. 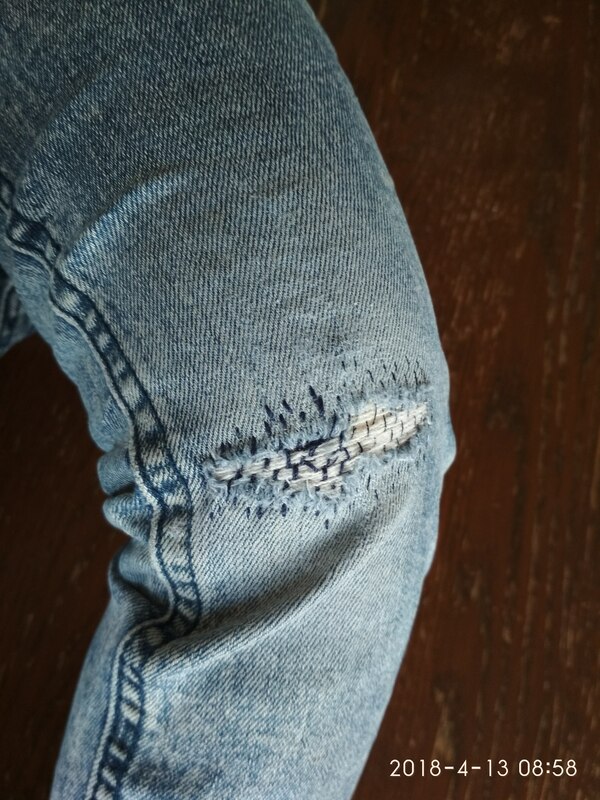 The part that I did sew will break again though, because I took only very little surface. I did so deliberately, because I would like it to break again and see where I end up then. Now for the final pants, and this one did take a while, it is a Zara pants that had broken fabric and patches glued to the back. 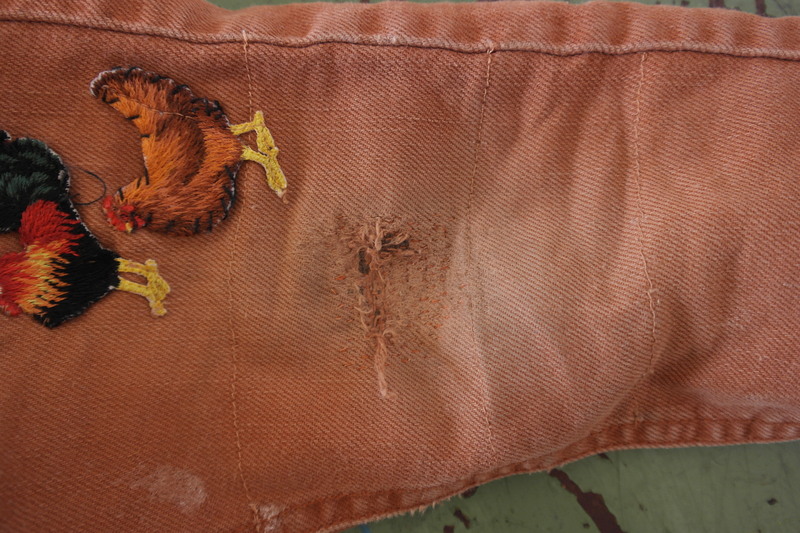 I took out the old patches because the pants were too broken to use these old ones. I tried matching the color of the stitching with fabric patches that I decided on using. 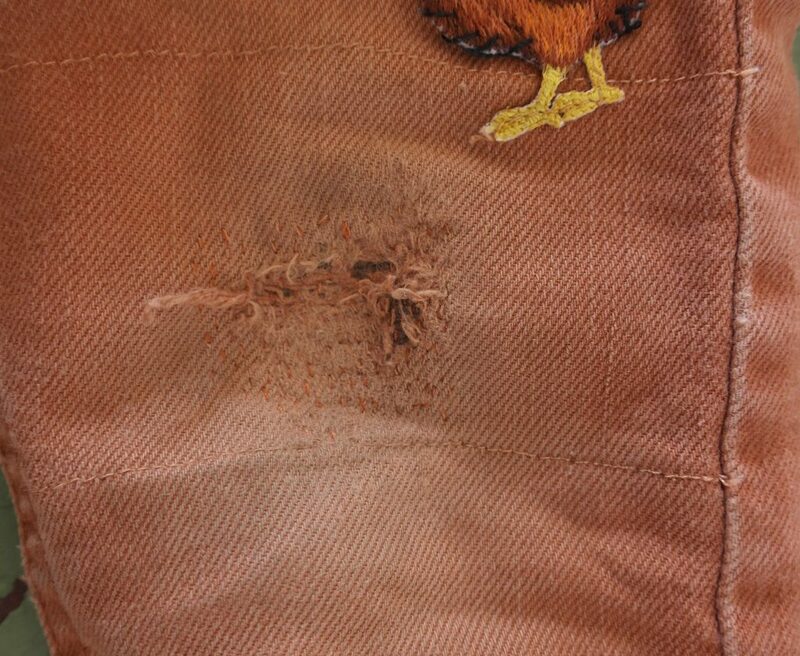 So with this one the patches are also non-stretch and the pants had a bit of stretch. I will find out what the effect of that will be in the long run. 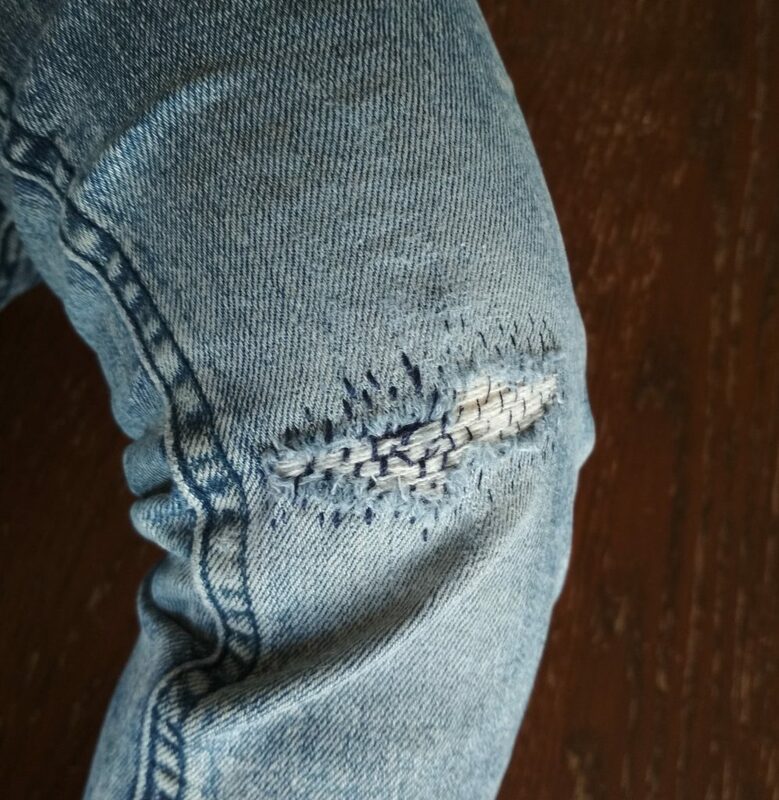 I hope, because I only use it on the legs it wont interfere with the wearability of the pants. So, it was a pretty big surface that I wanted to mend. It meant I had to be clever not to move the patch. As you can see I attached it with safety pins. I also needed a clever way to get room on the inside of the pants to stitch the needle back and forth. I used my kids tower buiding blocks for it. I put the correct size inside the leg, changing one time as I was going lower in the leg. And than I had room to move. It still took a bit of time but I think itwas pretty quick. This one is also only stitched one way. So only from left to right. I don’t think that is a problem because of the use of the patch on the back. As you can see I used a bit of creativity with the width and length of the stitches. 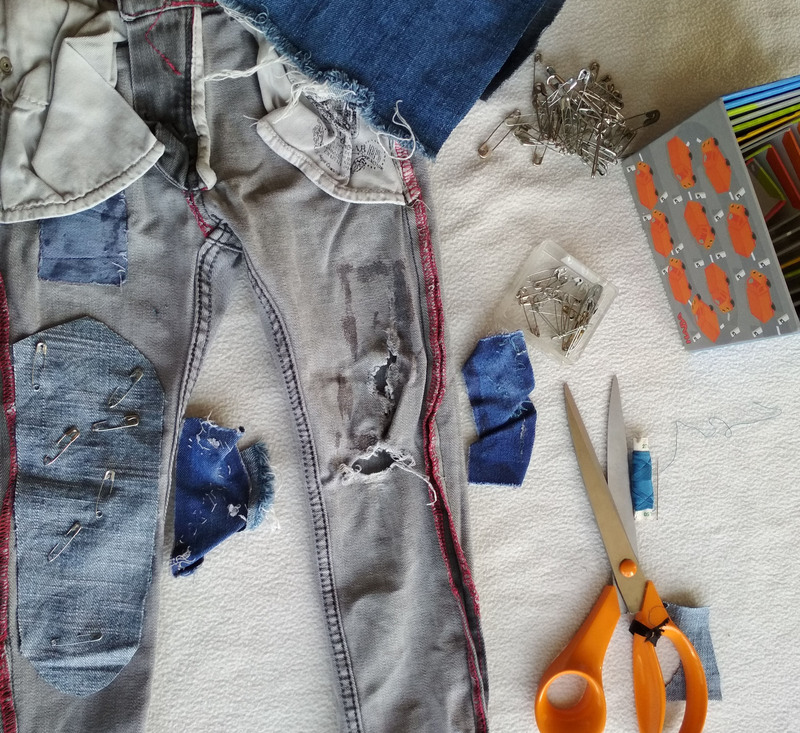 This I did to get a more playful effect but also to make sure that a slight change in stitching was not going to ruin the look of the pants. The shape of the holes were playful enough that I chose not to use too steady a stitch, which anyway I would not have been able to recreate until the very end. This would have made it look more boring and less poetic. I think this technique calls for more experimentation…. Endless possibilities! Posted on May 31, 2018 by Marjolein. This entry was posted in upcycle and tagged fixing before tossing, repairwork. Bookmark the permalink.